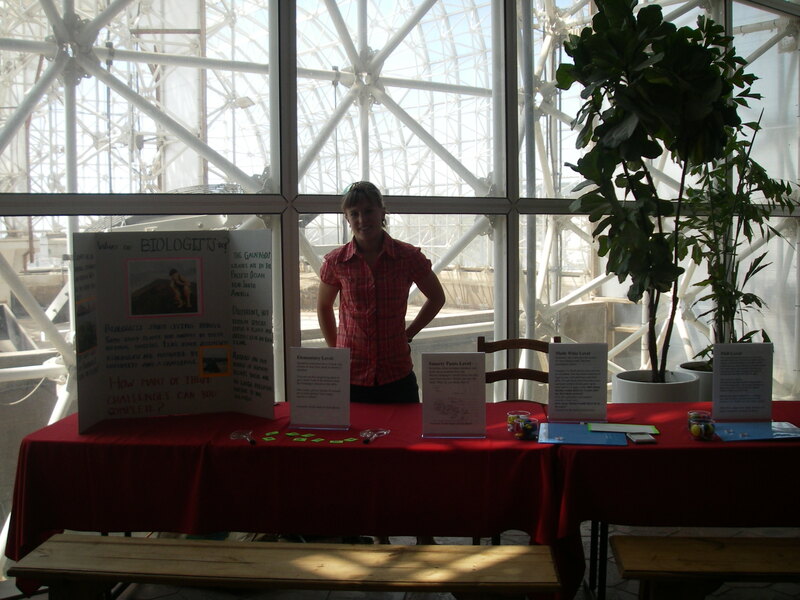 Here I am in March inside Biosphere 2's "human habitat" area near where the tour starts with some activities I created. Through the panes of glass behind me lie the mangrove swamp, ocean, and desert. Biosphere 2 was in the news in the last few days throughout their Earth Day celebration and the 20th anniversary of the original biospherean missions, in which people tried to live inside the sealed, regenerative system in the early 1990’s. One of the main lessons learned from those missions was the importance of Biosphere 1: the earth. So it is appropriate to celebrate both anniversaries at the same time. While the article today suggests the structure could serve as an “ark” for endangered plants, it is clearly not large enough to support self-sustaining populations of large forest trees. The inability of scientists who study ecological communities to predict the interactions of all the species from around the world meeting one another for the first time inside Biosphere 2 clearly pointed out how far we had to go to in understanding ecology. That is why I am working on my PhD, to contribute to a better understanding of populations’ interactions, especially in the case of new interactions. I plan to study how invasive plants affect the populations of native species when they spread out of control, as many grasses and thistles have done in North America (and worldwide really). 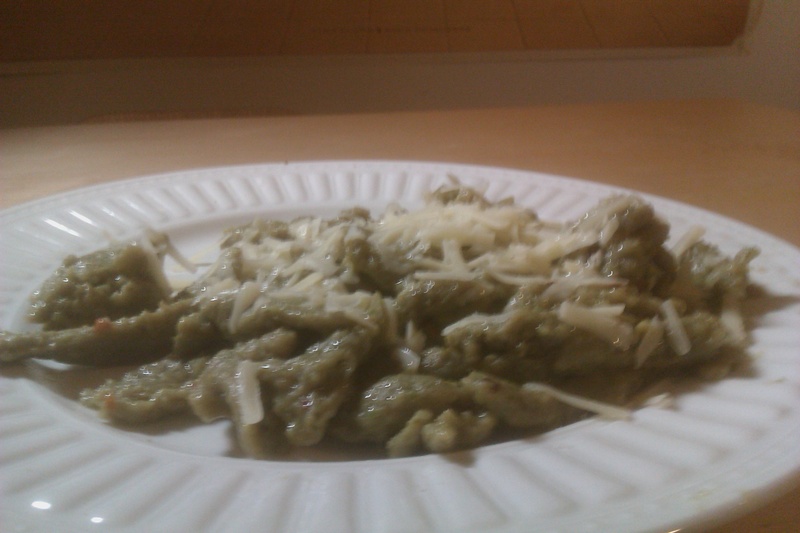 My first pasta making experience was successful. Emotionally I reacted as though I had just invented fire. What does my homemade pasta have to do with biology? That they are both green? Well, sure. That energy is being transferred up the food chain from the producers (the dandelion greens, spinach, frisee, and flour) to a consumer (me)? Yep. And energy is also being transferred from a consumer (a chicken) through its attempts to reproduce (eggs) to me, a secondary consumer. And by the time you have also considered the bacteria living in my digestive tract that help me digest food, we have a whole complex ecology of multiple trophic levels and a symbiosis. Pasta making can be as frustrating and baffling as trying to penetrate nature’s secrets, and, like all biology, pasta obeys laws of physics and chemistry. The first time I made past from greens, eggs, flour, and salt, it turned out inexplicably perfect and delicious. 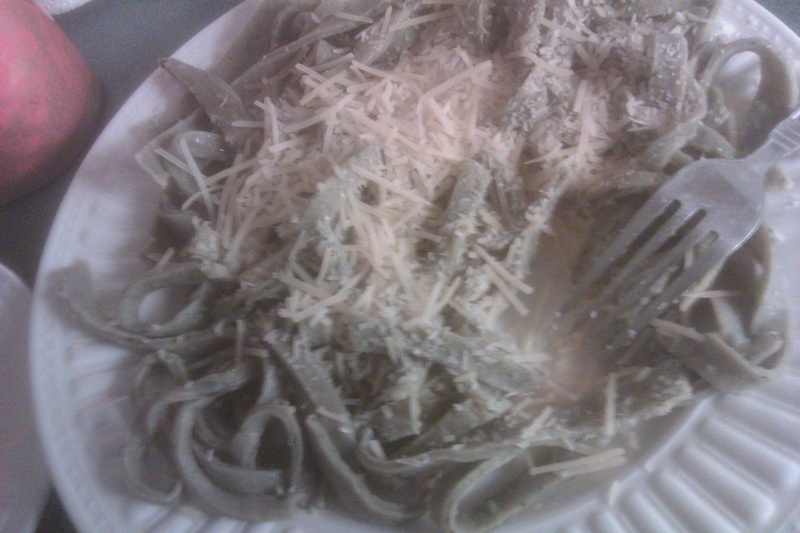 The green dough formed long strips of fettuccine that curled delicately on the plate. The second time, for whatever reason, the gooey mass that I attempted to slice stuck together in strips and balls, and when I boiled it became warty. Like any science experiment, the first results seem eerily irreproducible – but I have a hypothesis as to why. I suspect I did not add enough flour. Although I measured the requisite number of cups in, more flour gets incorporated as you pat the dough out on a floured surface, then fold it over to pat it out again. Or perhaps I failed to pat and fold the dough long enough for that gluten to bind to the other ingredients. The second attempt resulted in misformed, thick lumps that developed warts with cooking. What went wrong? Maybe next time I can do an experiment to test that: divide the batch into several portions, to which I’ll add varying amounts of flour, patting and folding for a fixed time. Another set of portions will have a set amount of flour to be incorporated during varying lengths of patting and folding. And if this whole PhD thing doesn’t work out, maybe I can get a job as a pasta chef.